These fabrics are suitable for making festive and striking garments. 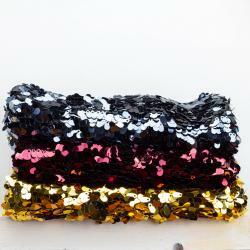 We offer sequins fabric in different shapes and colors so that the choice is wide. The sequins themselves have the shapes of rounds, pipes or drops and vary from matt to shiny. The fabric on which the sequins are attached is a kind of mesh that also contains some stretch. The fabric can also be used for making pillows. Quality: Polyester (100%) Width:150 cm Weight: ... g/m2 Product code: 3147021..
Quality: Polyester (100%)Width:150 cmWeight: ... g/m2Product code: 3147015..
Quality: Polyester (100%)Width:150 cmWeight: ... g/m2Product code: 3147016..
Quality: Polyester (100%)Width:150 cmWeight: ... g/m2Product code: 3147061..
Quality: Polyester (100%)Width:150 cmWeight: ... g/m2Product code: 3147051..
Quality: Polyester (100%)Width:150 cmWeight: ... g/m2Product code: 3147017..
Quality: Polyester (100%)Width:150 cmWeight: ... g/m2Product code: 3147022..
Quality: Polyester (100%)Width:150 cmWeight: ... g/m2Product code: 3147023..
Quality: Polyester (100%)Width:150 cmWeight: ... g/m2Product code: 3147007..
Quality: Polyester (100%)Width:150 cmWeight: ... g/m2Product code: 3147058..
Quality: Polyester (100%)Width:150 cmWeight: ... g/m2Product code: 3147055..
Quality: Polyester (100%)Width:150 cmWeight: ... g/m2Product code: 3147014..
Quality: Polyester (100%)Width:150 cmWeight: ... g/m2Product code: 3147062..